Here is where east meets west, where the wisdom of the past anticipates that of the future, where mindful nutrition meets strategy and good health. 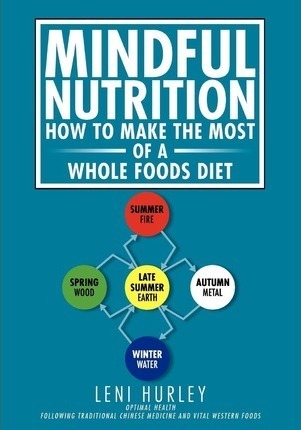 In this comprehensive guide for lay people Leni Hurley explains how to make the most of a whole foods diet. She takes the reader on a journey through the nutritional guidelines of traditional Chinese medicine using Western foods. This second version places the digestive system central: how strong is it and how do you maintain or improve it? Without a strong digestive system, even the best of foods can cause loss of vitality and ill-health. In particular, she takes a close look at the dietary requirements of Mother and Child. However, she also continues to give lifestyle and diet specific advice for all age-groups, from conception, through infancy, childhood, robust adulthood and beyond, to people in the middle-age category and the elderly. In all this, Leni Hurley explains the importance and the details of seasonal nutrition. She also looks at the body mind connection and how it impacts on our vitality and well-being. And she gives some tips for specific health problems. Overall, this book aims to provide information on how to prevent, or else overcome health problems through a combination of nutrition, exercise, and stress reduction techniques. Prevention is much better than the cure. Let food and lifestyle be your medicine! You can contact Leni via her website: www.lenihurley.squarespace.com.